The story continues! After the Hamburg Metal Dayz 2018 were a huge success, we are happy to start the presale for the next edition - join us in the Markthalle on September 20th and 21st for the hardest event in the context of Reeperbahn Festival! 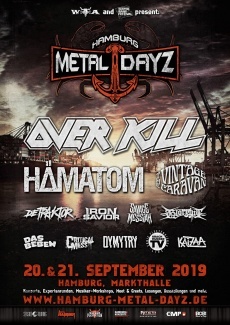 Register now your email address and never miss events, dates and news for HAMBURG METAL DAYZ 2019.